This will be the inaugural show for the new form of Eric Moeller and the All-In Band! 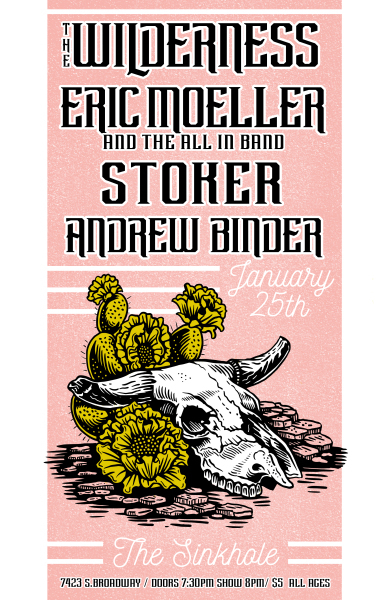 Phenomenal acts the Wilderness, Stoker, and Andrew Binder will round the night out so it's guaranteed to be a solid night of rock n roll and good times. Doors at 7:30, show at 8, $5, and it's all ages. Subscribe Now and Get New Content Monthly! It's here! Now you can subscribe to a new service we've launched at ​​​​​​ www.allin.bandcamp.com ! For a minimum of $5/ month, but giving as much as you'd like, you will gain access to exclusive content, from demos, to new tracks, to educational material about music and social movement, to who-knows-what! The possibilities are endless! It's a great way to get new content every month, all while supporting the current work of the All-In Music Project, and helping us to achieve our future goals like supporting other artists creating music consistent with our mission. Subscribe and get new content the first Friday of every month! Check out the video, then the head to www.allin.bandcamp.com and subscribe today! 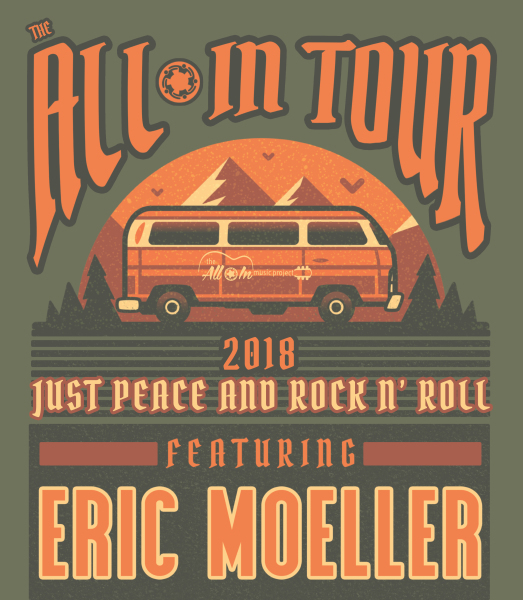 All-In Tour Returns October 12-17, 2018! If you are unable to make it to one of these shows, but would like to support the tour, you can make a donation, a purchase from our store, our view details below about our subscription service to support this tour, and all of our future endeavors. Thanks so much for your support of the All-In Music Project! We will see you soon! The All-In Tour kicks off at Foam in STL Friday night at 9:30! The rest of the dates are below! Come on out if you can and it's appropriate! We could also still use your tax-deductible donations or purchases to support the tour. Other than the kickoff, all of these shows are free and many are for the hungry and homeless. Help us nourish some spirits through rock n roll! Thanks so much for your support.